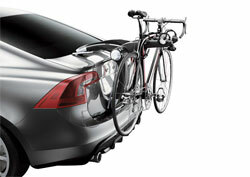 Thule manufacture a range of rear mounted bike carriers to fit a wide range of cars. Please use our bike rack selector guide to find compatible bike racks for your vehicle. Rear spoilers - unfortunately if your vehicle has a rear spoiler you cannot use a rear mounted cycle carrier. 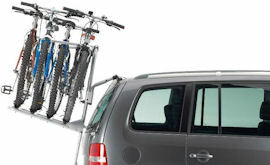 Instead you should consider a roof mounted or tow bar mounted cycle carrier. The Thule FreeWay will take up to 3 bikes. An economic alternative for mainly saloon and hatchback cars. If your car has no tow bar, this is the perfect cycle carrier that can easily be mounted onto the rear of the car. 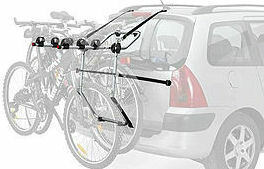 The Thule Raceway bike racks are the strongest and most secure rear mounted bike carriers available. Unlike most rear mounted carriers the Thule Raceway doesn’t use webbed straps, instead it uses Sure-Tight racheting cables to fasten the carrier to your car and FitDial to get a perfect fit. The Thule BackPack a popular bike carrier for mpv's, minivans and estate cars. Easy to fit, easy to use and secure. Special fitting kits tailored individually to each vehicle type provides a secure fitment.